Looking for fashion inspiration over the holiday weekend? The Museum at FIT currently has the Dance & Fashion Exhibit going on. If you were remotely moved by the ballet trend of recent years post Black Swan, or gave an exaggerated pose in slinky disco-inspired knits, this show is for you. The first section you encounter is a collection of extraordinary ballet costumes from the 1800’s and early 1900’s. Artisans made amazing creations inspired by the fantasy aesthetics of exotic cultures. The Ballets Russes and its “Orientalism” aesthetic in turn inspired many fashion designers like Paul Poiret and Yves Saint Laurent. Balenciaga was famously inspired by Spanish Flamenco dance. Following in his footsteps were designers like Elsa Schiaparelli and Oscar de la Renta. The collaboration of fashion designer and dancer has a longtime history. In modern dance, Halston is often associated with the body conscious look of Martha Graham’s dance company. The looks then spilled over into high fashion and street wear. Stephen Burrows capture the disco era with dance-friendly knits. Alvin Ailey has often taken street culture and street fashion as muse in their productions. Designers Christian Lacroix, Jean Paul Gaultier, Prabal Gurung, Giles Mendel and Olivier Theyskens have all designed for the New York City Ballet. 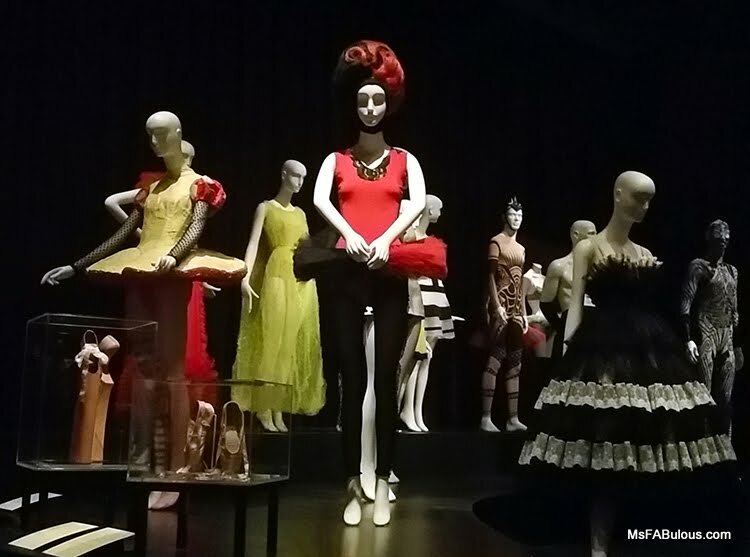 In turn, their costume director Marc Happel has paid tribute to designers like Christian Dior and Balenciaga in his own work for the New York City Ballet. The designers behind Rodarte were well publicized for their contributions to the Darren Aronofsky film Black Swan in 2010, and tulle and ballet flats hit the streets in the seasons that followed. The exhibit paired the punishing structure of Anna Pavlova's ballet pointe shoes alongside extreme styles from Christian Louboutin and Noritaka Tatehana that were inspired by them. Designers’ fascination with dance is so strong that many have featured the dancers themselves on their runway, like Zang Toi’s Ballerina Babes collection and Rick Owen’s spring 2014 show featuring African American stepdancers (watch it, it's fierce). A good fashion designer makes clothing that is comfortable, functional and beautiful. Dressing a dancer is the ultimate challenge to test those skills. Maybe all designers need to ask their fit models to bust a move. The streets are today’s runway. The runway is a stage. Maybe if all the world's a stage, all the men and women merely dancers. Dance & Fashion at the Museum at FIT runs until January 3, 2015.